Hello, people-I-swear-to-write-but-never-do, relatives, and/or those who have filled me with a sense of obligation by mailing me something first! Greetings of a seasonal variety to you! May your Christmas season be full of love, hope, peace, and other fruits of the Spirit. Job: Yeaaah, I’m still at the law office. I’ve now spent half a year as secretary for two attorneys, without more salary to show for it. Awesome. Also awesome: doing anything with the court of appeals for the first time; we are all of us flailing about and consulting the court rules every 5 minutes. Housing: You may recall me living in a rental house with 3 other ladies. As one of my erstwhile roommates got married and remained with her spouse in the house, Cecilia and I moved a whopping .8 miles north and east across Washtenaw. This is close enough to walk between them, but far enough that anything you sent to my old address will miss me. Except that I eventually put my mail on forward. I meant to send you a tidy little handwritten note with my new address, but that just didn’t happen. Sorry. Romantic Relationships: Hahahaha, psych! There’s been nothing of the sort for the last eight years at least. This year, I went on 3 mediocre dates and 1 decent one, followed by some uninspired texts and no calls. Friends have suggested I broaden my field of search to include more states, or at least the Fort Wayne seminary. I may yet do so. But! I am not without commitments: I have bought two new bookshelves this year and, by virtue of having a roommate who did the actual acquisition, acquired two kittens. I’ve also become an official member of St. Paul’s Lutheran Church, having decided after 1.5 years in their choir that I wouldn’t just run off somewhere else. Except for the weekends when I’m off attending weddings, when I will run most anywhere given sufficient notice. There were three such weddings this year – those of my erstwhile housemate Hannah G. W., my other erstwhile housemate Liz C. N., and my concert-going, somewhat-indie music-supplying, lemon-jousting drinking buddy Hannah M. K., whose Astoria wedding was a delight to witness and stand up in. I also attended my friend Zach’s ordination to the Roman Catholic priesthood, which is basically like a wedding, except without a 300% markup on the celebratory cake. There is now another wedding on the horizon, as my brother Paul is engaged to one of my dearest friends, Michelle; I am quite pleased for them (mostly because I am not the one currently dealing with obscene markups for nuptial celebration paraphernalia)(but also because I love them both dearly and, you know, hope they will carry on in delight together &c)(that said, Paul could be a bit less nauseating in his effusions of loving feeling)(someone get me a bucket). Other celebrations: 12th Night (complete with Shakespeare, almond cake, and crowns); my first Feuerzangenbowle (complete with fiery sugar and carol-singing); Michaelmas (complete with more Milton than I’ve ever read in one sitting before); St. Crispin‘s Day (complete with yelling the Henry V speech to passersby on Mackinac Island); and birthday celebrations of several people, including me (complete with playing two games of Boggle at once! Or eating Moroccan food/bowling/drinking Greek wine/reading Evelyn Waugh/however we celebrated birthdays). I also basked in the reflected glory of my brother John competing on Jeopardy! in January, and his return for the Tournament of Champions in November. My own knowledge of trivia has not been sufficient to get me past the online Jeopardy! test, but it HAS won me a few rounds on LearnedLeague.com. Aw yiss. So much less of a timesink than either TriviaCrack or JetPunk, addictions which I have overcome! …Sadly I have not overcome my addiction to Sherlock fanfiction; please pray for my soul and/or recommend a support group. No one can tell this deer is wearing jeans anyway. On the bright side, I have profited greatly from reading both The Joy of Less and unfuckyourhabitat.tumblr.com, not that you can necessarily tell by looking at my work desk or my bedroom. But I’ve managed to dispose of some papers that had lingered for the last year or six, and got rid of some brown pants just in time to miss them at Halloween. Other consumables: Continuing my tradition of checking things out of the library for as long as possible, I’ve had a couple books by Milosz out for 2 years now. It’s like grad school library privileges without needing to be in grad school. Books I actually read include some volumes on orthography, a couple intriguing books by Neil Postman, and I, Robot; generally my reading material has been more poetic, word-loving, critical, depressed, and mildly feminist. Viewing-wise, this has been the year of my finally watching Die Hard, The Room (via RiffTrax Live), Zoolander, and White Christmas for the very first time. National Theatre Live brought Coriolanus and Hamlet within my purview, for which I both bless and curse them. 2015 also involved an Iron Man marathon (which, lest you be deceived, involves no physical activity) and more watching of The Decoy Bride / Not Another Happy Ending than is strictly advisable. Not to mention The Mindy Project, Inspector Lewis, and odds and ends from Parks and Rec. I remain a member of the UMS Choral Union, which performed Mendelssohn’s Elijah and Handel’s Messiah; as mentioned above, I’m part of my church choir as well. Occasionally I pinch-hit as an alto because we are as poor in altos as we are rich in sopranos. Shocking, I know. This year’s culinary adventuring included the eating of Moroccan bistilla (would recommend) and the cooking of meringues, gluten-free pizza, and gluten-free fried chicken. There were also a fair allotment of cocktails: lots of G&Ts and a fair sampling of Drinking with the Saints. Also wik: I read with some alacrity the epic saga of Brother Orange; I learned more of the geography of John and Elizabeth’s neighborhood whilst dogsitting, when I accidentally walked their dog Hektor 5 miles longer than necessary; and I did the most Pinterest-y project of my life, namely, using twine and clothespins to hang a bunch of stuff, mostly calligraphy, on my bedroom wall. There you have it: a far longer summary of a year than you might want or need. Merry freaking Christmas, y’all. See you all in 2016, unless I don’t actually. Onward, majestic Frog Steed! Onward to 2016! Typically when my sister muses leave me alone in the club too long, I start talking to myself and tend toward the confessional. 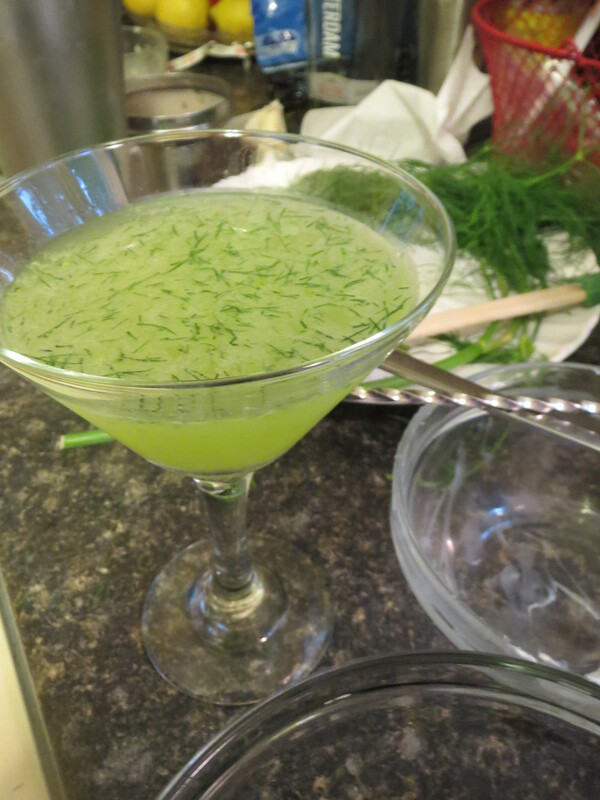 That might yet happen this week, but first: yesterday’s festival of dill. It could be said that this all really started back in May, when my housemates and I decided to have a somewhat formal tea. We prepared a couple different pots of tea, dairy-free coconut scones, and cucumber sandwiches in plenty. Thus my purchase of, and introduction to, fresh dill. 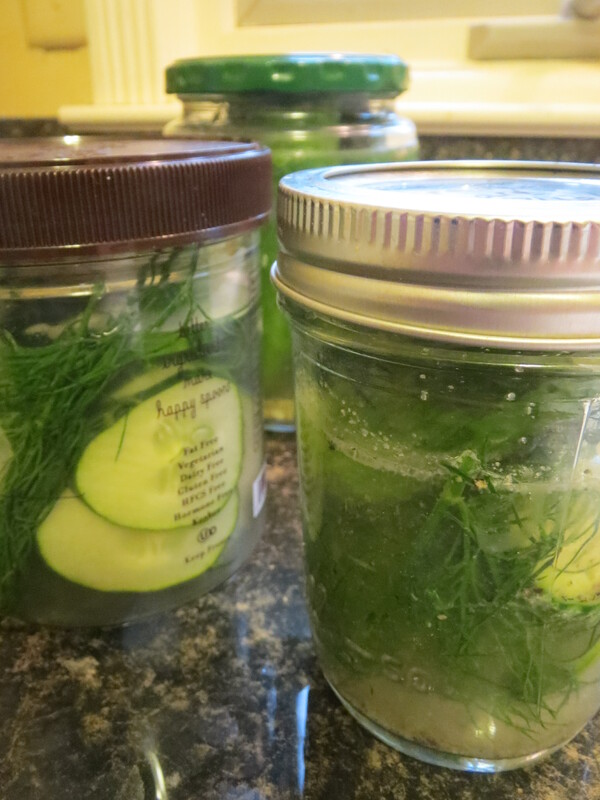 Prior to that, I’d only encountered dill as in a mirror, darkly: dried and faded and sprinkled on salmon. The fresh bundle was luxuriantly green and terribly fragrant in comparison. Somehow yesterday demanded a reprise of that redolence, a reappearance of those feathery fronds. It is like having both delicate seaweed and a weeping willow inside one’s kitchen. The first order of business was to mix some chopped dill into a bit of butter and a bit of cream cheese for English muffin purposes. That done, I decided to infuse a bit of gin with a few stems. Then the requisite refrigerator pickles: some are garlicky, some are a little peppery, all of them are dilly. After that, I still wanted to make something, but wasn’t quite up for baked salmon, borsht, or mizeria. 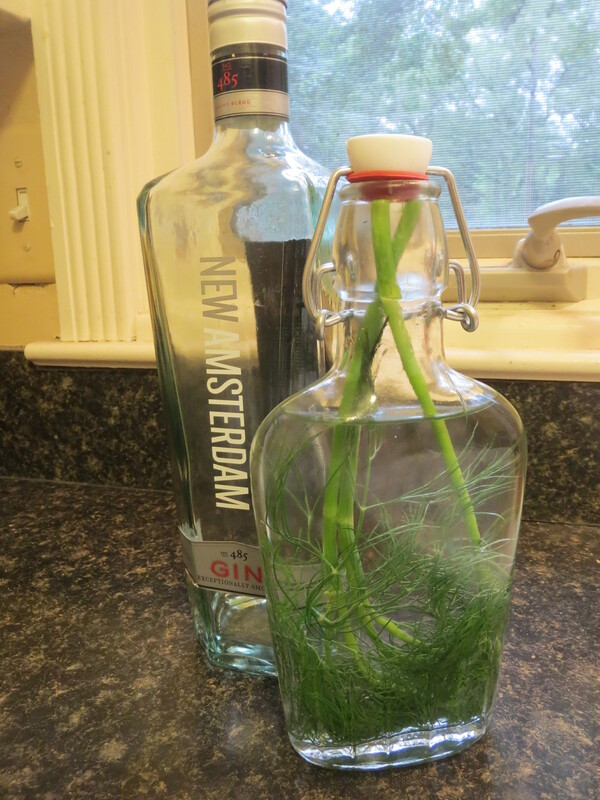 Since the dill in the gin had only begun macerating…I grabbed a bit more dill, a bit more gin, and muddled them together. 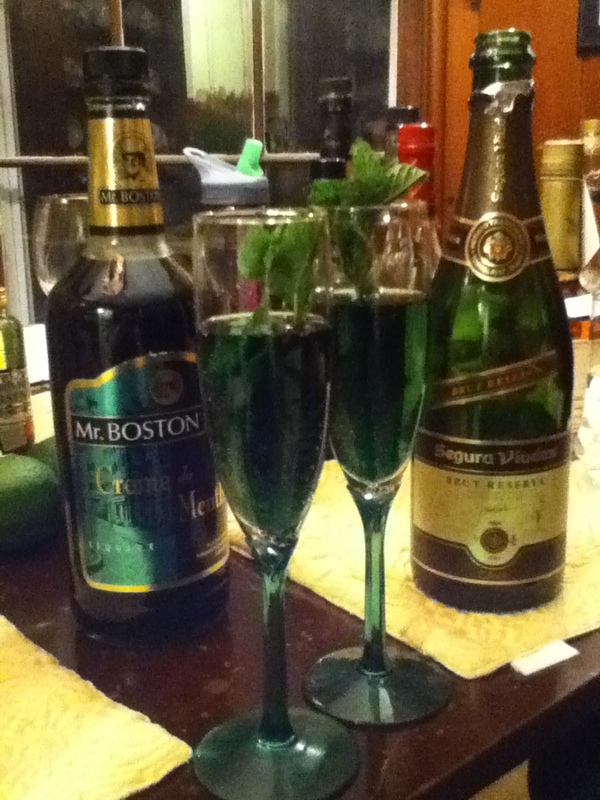 In went some lime juice and some liqueurs: honey, vanilla, ginger, and Chartreuse. The result was a bit like drinking in a sunlight field entire. It struck me as fitting; generally, smelling dill is like breathing in a forest and a field and the sea all at once. What do you do with dill? Earlier this month, my housemate Cecilia requested of all and sundry that someone bring Tom Hiddleston to her. Since none of us have made his acquaintance (and since honor demands that another friend meet him first, should it ever depend on me), the best thing I could offer was a Hiddleston-inspired cocktail. Something proper and classic, but also playful. Obviously mead given his asgardian roots. It would have to involve gin. Something that makes you raise your eyebrows and go ‘daaang’. a gin and tonic with extra lime for that dazzle that gives little playful dollop to a classic beverage. The two of us also brainstormed a fair bit: we wanted something classy and elegant, appropriately British, sweet, strong, a little fruity or perhaps a little nutty. Then Cecilia said “Fun, but with an edge; a little bit crazy,” and I wondered if we were still talking about Tom or if we’d conflated him with his various roles. Verdict: appropriately sparkling; good and all, but more formal; not quite a pajama party or anything. We tried adding ½ a tablespoon of Fee’s grenadine. Adding some sweetness was a good idea, but it turned out to be too much; this whole recipe needs some work. Stir gently and strain into cocktail glass. Verdict: This is a paler green, but comes much closer to the “crazier than a bag of cats” taste we were going for. 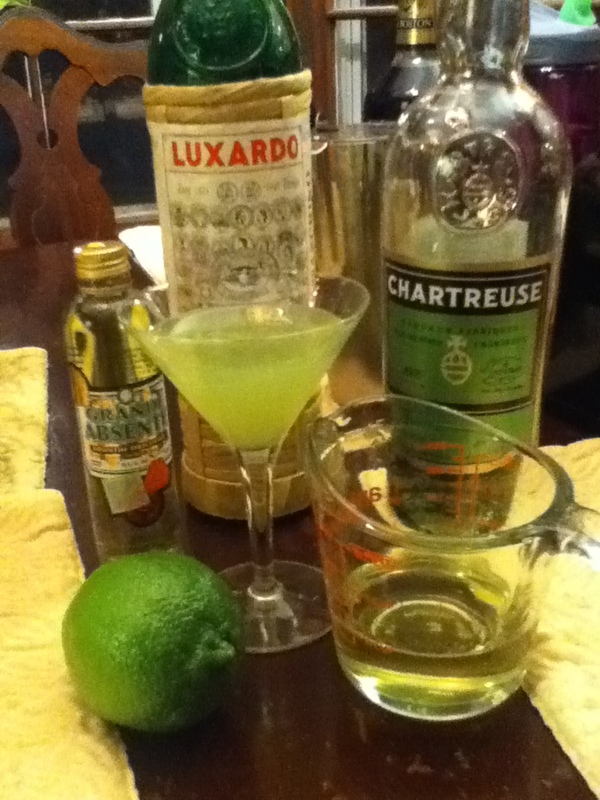 It’s very similar to a Last Word, but removes the gin and adds the anise taste of absinthe. I was well satisfied. Stir in a martial fashion and strain into cocktail glass. Sip while looking down your nose at the rabble. Verdict: It was quite as red as we hoped for; the strength of the vodka, bitterness of the Campari, and some visual allusion to all the blood covering Coriolanus were our chief goals. 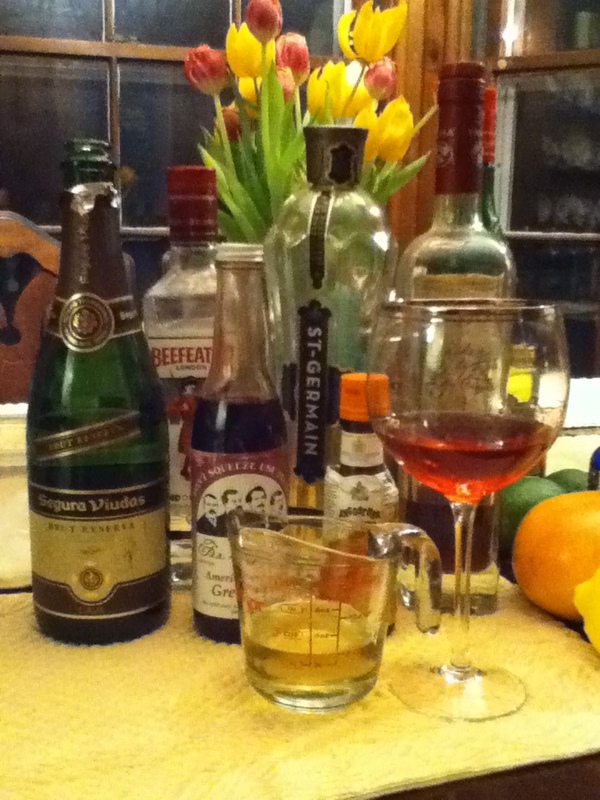 In addition, since we were surprised by how sympathetic all the characters were in the Donmar Warehouse production, we added the syrup and liqueurs to make it go down a bit more easily. 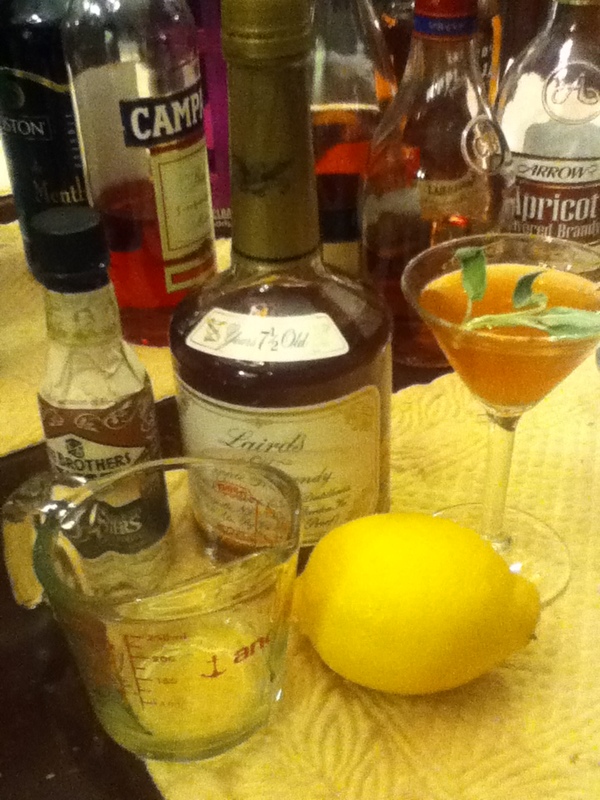 Shake, strain, and garnish with a sage leaf. *Boil a cup or so of sugar and water with sage, thyme, and rosemary for remembrance; strain and cool before use. Verdict: This is something of a modified Sidecar, made with ingredients that evoked a much more rural England of centuries past. Cecilia declared that it was “more Kenneth than Tom because of the sourness/bitterness.” I declared that we had had enough to drink. …then shall our names, Familiar in his mouth as household words – Harry the king, Bedford and Exeter, Warwick and Talbot, Salisbury and Gloucester – Be in their flowing cups freshly remember’d. On one hand, I’m leery of being That Single Person Who Is Always Lamenting Her Singleness. On the other hand…these are all good ideas, practical ways of being charitable, and Lindsey has written them in a charitable way. I’ve been blessed with a loving and giving and supportive family, friends who ask, married friends who invite. But that doesn’t always take away the loneliness – especially as more and more of my friends get engaged and the circle of comrades-in-singleness shrinks. Do you think there’s anything she missed? On the other side of the marriage fence, there’s the opportunity to bear new life, but it doesn’t always turn out as planned. I have at least six friends who have suffered miscarriages, some of them more than once, and it’s…well. It hurts. It’s hard to talk about, because what do you say? Death has made its way into the sphere where we expected life. I can’t imagine it. However, I’ve learned from those friends that the loss is real, the grief is real, and the care we take in discussing it also should be real. Sometimes I ask the denizens of Facebook their thoughts or preferences or whatnot. Yesterday I asked them about their favorite prayers, and got all manner of fascinating responses! Some tend toward the short and simple: Lord, have mercy. Jesus, I trust in you. I believe; help my unbelief! Others go for the beauty of traditional prayers, like this one by Ephrem the Syrian: O Lord and Master of my life, give me not the spirit of sloth, meddling, lust for power and idle talk. But grant unto me, Thy servant, a spirit of chastity (integrity), humility, patience and love. Yea, O Lord and King, grant me to see mine own faults and not to judge my brother. For blessed art Thou unto the ages of ages. Amen. Expect to see more mention of prayer throughout Lent. What do you pray for the most? Between the drink menu at Zola Bistro, where I spent an evening with my housemates last week, and this fun map quiz, I have whiled away some pleasant times! Make a note of which drinks you’d like, should you ever come to call, and let me know how you fare should you join me in quiz-taking. It has been so long, friends, since we’ve had a review of anything but a book on here. Sure, there was a play review in January, and a poem review last May, but nearly a year has passed since we last shared a review of beverages. 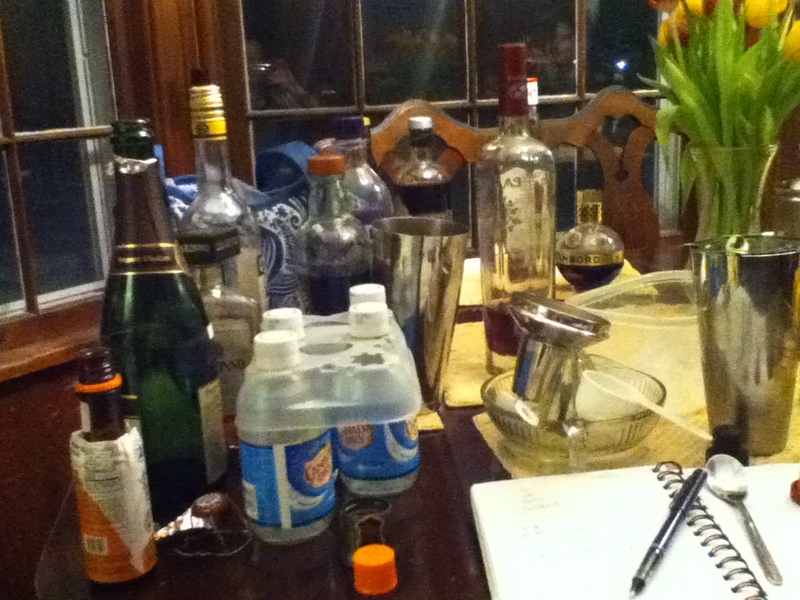 This should be remedied, so grab a glass and a seat while I tell you about last Saturday’s Meadfest. On hearing that the B. Nektar Meadery of Ferndale, Michigan was having a mead-tasting festival, several friends and I decided to conduct ourselves thence. I was put in charge of all Beowulf references, and packed my Chickering accordingly. duguð unlytel Dena ond Wedera. no small gathering of Geats and Danes. Huddled against the brisk breeze, our crew meted out beverage tokens to try 11 of the varieties available and recorded our impressions at the tables and folding chairs standing in for mead-hall benches. The wind whipped our cups over if ever we were careless, and the sun, overly concerned by the possibility of bothering us, kept hidden. 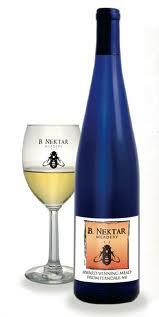 Lager-Style mead: sweet but not oversweet, no bad aftertaste. PCS approval. IPA-Style Evil Genius: Lightly carbonated mix of honey and hops. “Nose of wine, taste of Kool-Aid.” “That really just tastes like I ate a field of flowers.” Grapefruity. Like unto Jerome more than Ambrose or Bernard. Necromangocon – made with mango juice, honey, and black pepper. Very bubbly. Smells of mango, tastes peppery. Peculiar. Apricot Cardamom – fascinating and strange. Very tangy, spicy, not hard cider-y. Smells more like apricot than it tastes. JCS approval. Zombie Killer – technically a “cyser,” or blend of honey and apple cider, with tart cherry juice added and light carbonation. Apricot tang; very fruity. Like a Lambic beer. “Sparkling black cherry juice” (which I misheard as “carrot juice,” and was instructed to buy an ear trumpet for reasons both practical and sartorial). JCS approval. Wildberry Pyment – Made with clover honey, shiraz grapes (pyment = mead/wine mixture), and wildberry concentrate. This last made it slightly like cough syrup. Very winey. Blackberry jam. Ooof da. Increasingly hard to drink. Sweeter, peppery? Unicorn – smells like different cough syrup, different fruits. Less sweet. Rainbow – sweet, traditional smell, but drier taste; a field of delight! Orange Blossom – less like syrup; Kool-Aid with chalk. Smells light; floral. 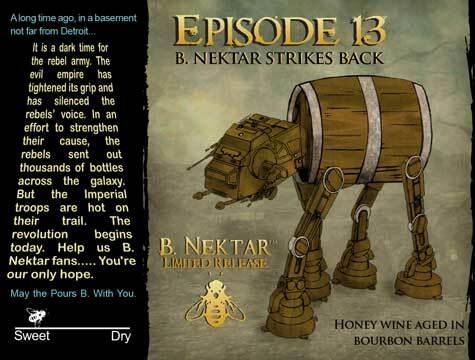 Episode 13 – orange blossom/buckwheat honey mead, aged in a bourbon barrel. Curious to smell; sweet, then quite smoky to taste; thicker in mouthfeel with a toasted vanilla aftertaste; almost meaty, the way buckwheat can be; and “like unto whiskey-flavored gelato.” PH approval, enough to buy a bottle of it. mildum wordum, swa sceal man don. Today is the anniversary of the repeal of Prohibition. As a person who enjoys both liquor and smaller government (and who is horrified by some of the political corruption, gang wars, and general loss of Gemütlichkeit that Prohibition enacted), I think it worth celebrating. This honestly turned out a bit more political than I meant it to be. I guess that’s what happens when you parody The Who? Also, you end up learning a bit more about history. If School House Rock calls, send ’em my way. Let the drinks be poured! We can buy booze again! And not by bad poteen! here’s to biergardens that luck kept alive! 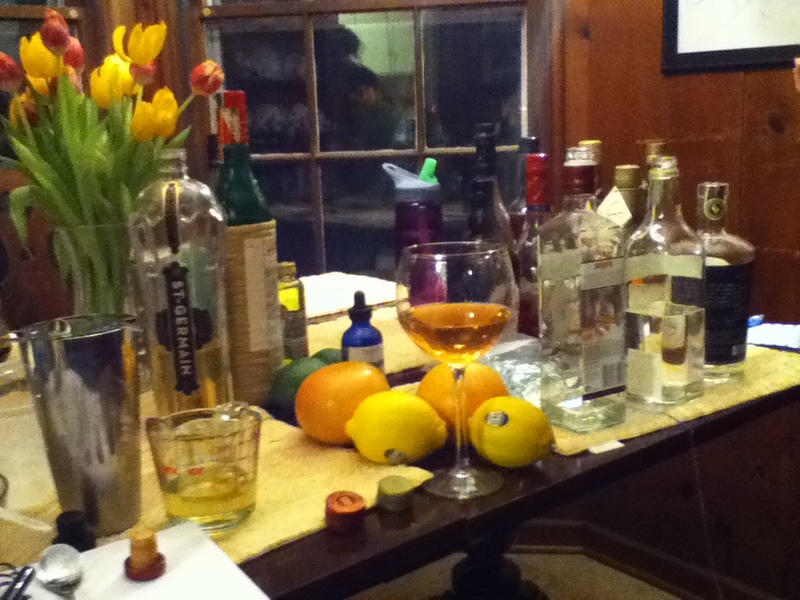 Huzzah for highballs, fizzes, flips, and sours! But there is hope! 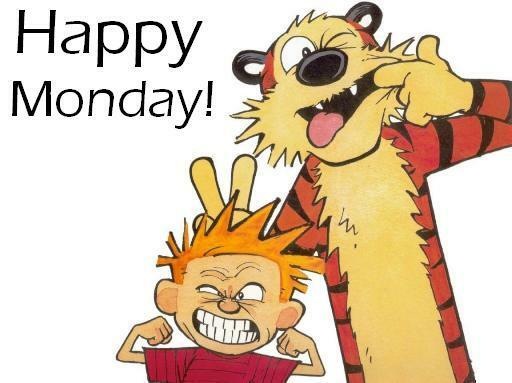 We Egotists have weapons against the “mneeeeaaarrgh” of Monday, and we are here to share some of those weapons with you today. Terpsichore is delighted that the warm summer weather has fully come. 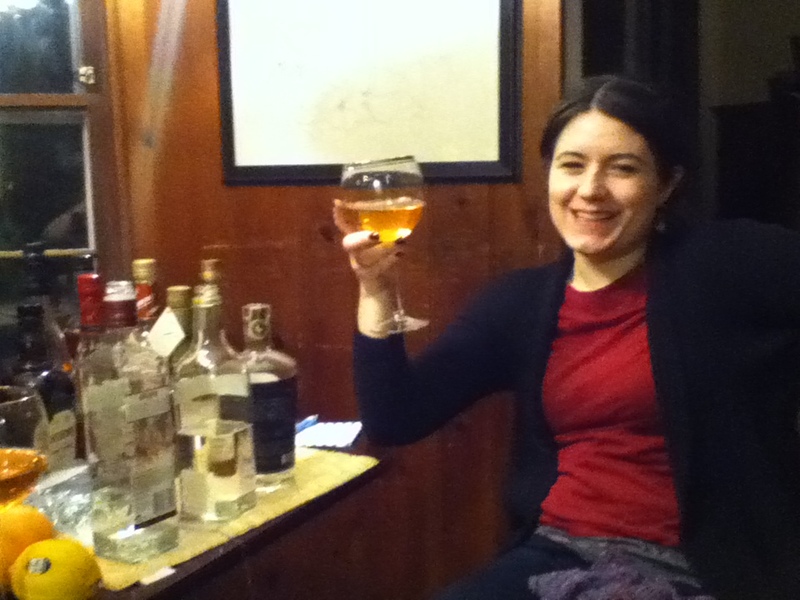 She recommends you get yourself some nice bourbon and create a Havana Bourbonade with it. Check out her blog for directions! I, Thalia, am feeling dippy and surreal on this drippy and serious day. Nothing suits my mood quite as well as the Debussy violin sonata. Written in 1917 right before Debussy died, this lovely sonata is full of colors, timbres, and impossible imaginings. James Ehnes, my violin hero, plays a gorgeous interpretation. The two of us are trying to use up the cans in our pantry before we move out and have to heft their cheap but valuable bulks around. We’re going to make some delicious Tomato and Sausage Risotto, recipe by the fabulously wise food oracle Deb. Melpomene hasn’t really told me what she thinks you should read today, but I’ll pass along a recent recommendation that she made to me. Make a bourbonade, listen to the Debussy and read Richard Wilbur’s The Writer .